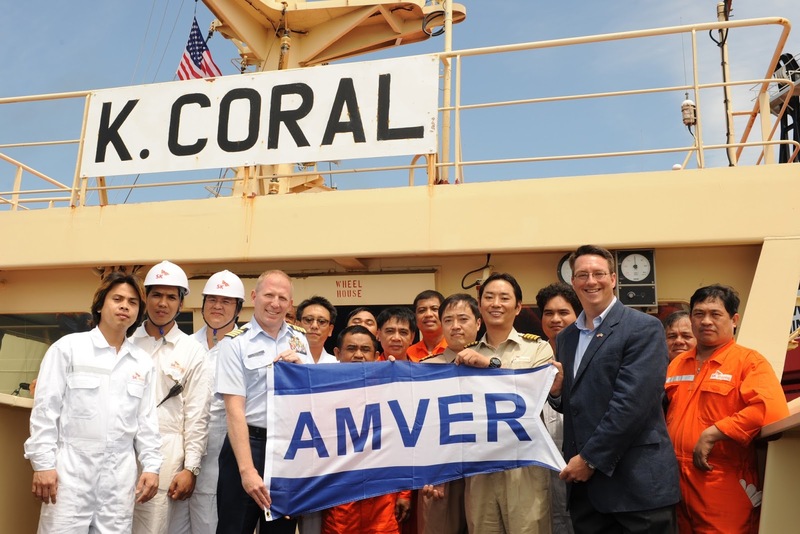 Amver director Benjamin Strong, along with U.S. Coast Guard representatives from Sector Long Island Sound and Boston, Mass. recognized the crew of the M/V K. Coral in New Haven, Conn. for rescuing 19 fishermen 900 miles southeast of Bermuda. "In the wake of the International Maritime Organization's Day of the Seafarer, which was themed At Sea For All, it is only fitting that we recognize the brave seafarers of the K. Coral for saving 19 fishermen," Strong mentioned while presenting a certificate of appreciation. "These crewmen have set the example and should be proud of their accomplishments," he added. The K. Coral is managed by SK Shipping of Korea and enrolled in Amver on September 26, 2011.